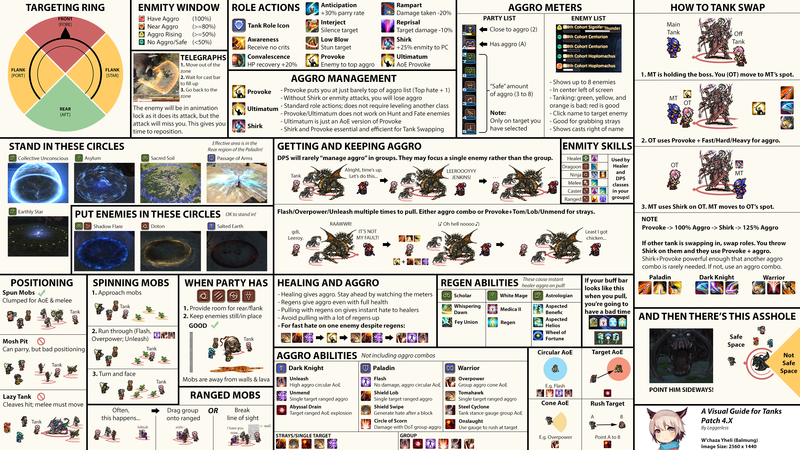 With an influx of WOW refugees from an overall disappointing release of WOW:BFA, and the announcement of 5.0, Shadowbringers expansion, I thought to compile a list of useful info for someone who is interested in or new to FFXIV. This guide will contain a concise overview of most aspects of the game, such as how to get started, how to reach the end game, and what to do once you get there. Not every section will be useful to everyone, and nothing here should be taken as absolutes, but I hope new players can be directed here for an up to date(4.5), one-stop shop for a comprehensive overview of the FFXIV experience. Thriving and generally friendly community. Welcoming for all skill levels. Aesthetically/stylistically pleasing, and has seriously fantastic music scores. Praised for the superb story-telling and writing as an MMO title. Unique character system that allows players to do everything on one character, including becoming every job (all it takes is a simple gear change to enable a whole new set of skills). No need for alts and multiple story completions. Overall stellar end game encounter and combat design. Deep social and non-combat activities such as housing and crafting (among many more features). Great controller support and seemless cross-platform play with PS4. Lesser emphasis on PVP content relative to most other titles. Players can still very much enjoy the activities available, but usually not as the primary focus. Old engine has strange quirks/limitations, and some players report server stability issues. The initial playing experience and combat in general is incredibly slow for a MMO vet. Many players abandon the game simply because there is a mountain of mandatory quests barring them from getting into the outstanding expansion/current contents. If quests aren’t your thing, then you might struggle with this aspect. Content releases are predictable and consistent. They are not looking to remake the game with each update, so you always know what to expect (new raids, dungeons, story, etc). The game director has previously said that they don’t expect players to stay subbed 100% of the time. The game can be taken month-by-month, based on individual goals. There is a cash shop containing mostly cosmetic items as well as level/story skip potions. Does not offer any advantages in gameplay, and is not part of a pay-to-win model. Jobs offer no customizations/skill trees/etc, but is very well balanced compared to most titles. There is a strong emphasis on dealing damage regardless of your job choice. The Global Cooldown (GCD) is 2.5 seconds. Combat will be slow-paced until further Off-GCD and GCD reduction abilities are introduced as you level up. Don’t be discouraged by the early levels, and know that the combat builds on itself in layers through encounter and rotation complexity. SOUNDS GOOD! HOW DO I START? There is a no time-limit free trial, with a level cap of 35 on all classes/jobs. Note you can’t go back to this after adding a full license. The base game called the Starter Edition contains A Realm Reborn (ARR), and is good until level 50. If you buy the Stormblood expansion, it will also include Heavensward(HW), the 1st expansion. This gives 5 new jobs, 1 new playable race, as well as raising the level cap to 70. The complete edition will include everything, and any edition can be upgraded to collector’s edition for extra mounts/minions/etc. The base game comes with a 30-day subscription, but subsequent playtime has to be purchased at roughly $13-15 USD. On PC, the game platform is either Steam or Non-Steam. Game licenses /accounts / purchases are separate from the two, so you will not be able to switch between them once committed. There is an Official Benchmark Tool to see if your system can handle the game. Gender / Clan / Race / Appearance have no meaningful impact on gameplay mechanically, pick what pleases you. This can be changed later with a Fantasia Potion (Only one is given for free when you play, otherwise it costs real $ to obtain more). Your server will be in North America(NA), Europe(EU), and Japan(JP). 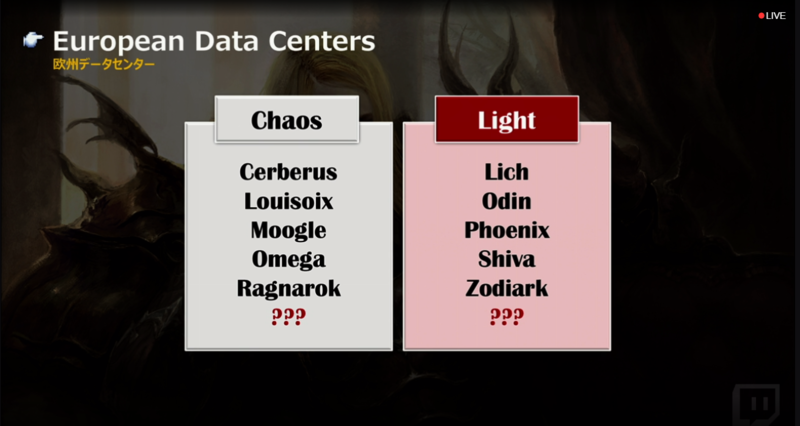 Each region will have Data Centers(DC) which contain Worlds, and the Worlds within the DC will be able to do most content together (raiding, dungeons, and etc). All NA DCs servers are located in the West Coast. There is a DC shuffle (NA|EU) coming early next year (2019), and every affected player will be given a free transfer. Some worlds will have a preferred status, meaning that every source of experience will be doubled for a limited time. These servers are generally lower population, and is great for if you want to level multiple jobs. Feel free to take advantage of this before the aforementioned DC shuffle. Starting base class will dictate your starting city, but the storyline all converge at level 15 when you unlock the ability to travel to other cities and pick up new jobs/classes. Go with what you find interesting based on the Official Job Action Video / Official Job Guide. Tanks and Healers will have shorter queue times for group content typically, due to players having preference for damage dealing roles. Most content in FFXIV is locked behind the Main Story Quests (MSQ, denoted by a quest symbol with a meteor-shaped background). Unless you buy a story skip, you will need to do every single one. They range from basic overworld fetch quest to instanced combat. This will be your primary source of XP on your first job. It is generally recommended that you focus on completing these and not get side tracked too much. A special kind of quest denoted by a blue background means that it will unlock some sort of feature upon completion. This can mean new job skills or access to glamour(cosmetics) and more. These are generally important and worth exploring. Remember to pick up your advanced job at level 30! Plain side quests, deonoted by a yellow (! ), are mostly optional and are done for a small amount of xp or extra lore. Some do unlock optional rewards/content, so you can check under this progression and level-locked content guidefor some bonus items of interest. Multiplayer instanced activities are done either via the Duty Finder(DF, default keybind “U”), or the Party Finder(PF). The DF is the game’s automatic match-making system, where as the PF will be the manual option. Dungeons and Trials you come across the game as you progress is usually done through the DF. Leveling dungeons (15-47, 51-59, 61-69) are a great source of XP if you happen to need them. A feature located in the DF is the Daily Roulettes. They are categories of activities pooled together (such as all leveling dungeons, or all trials) to increase the use of older content by providing rewards/incentives for players of all level ranges that complete them. Note the bonus reward is only applied once daily per category. Side quests, Fates (Overworld events), Leves, and Beast tribes, are also sources of solid XP. You can treat the FFXIV leveling and story experience largely as a single player game, with numerous multiplayer dungeons and trials sprinkled throughout the journey. The early game does not do a good job making it easy to play/quest together with friends (Aside from the dungeons and trials). The game isn’t meant to be rushed. If you find yourself bored of the endless fetch quests and dialog, you are probably not alone. The 1-50, 2.0-2.4 ARR MSQ experience is generally considered super slow, but the buildup will all be worth it. Keep in mind that patch content was meant to be drip feed to players over months/years. Feel free to branch out and take breaks. Starting out, you should attune to all the big/small aetherytes (teleport spots) when you pass by them. You can set large Aetherytes as preferred/home to reduce cost. Each base class has a hunting log you can complete for some early XP. The weekly challenge log is also a great place for various rewards when you first start out. Do the novice quest line at level 15, gives you gear and a nice ring that boosts XP. Located at major cities’ adventurer’s guild (Green sprout icon). Vendor gear is useful for replacing outdated stuff. Do use Gil on teleports. Time > money. Note you can also click on the aetherytes in the mini-maps to teleport (hold Ctrl to bring to top). Sprint is an ability unlocked by default. Remember to use it. Logging off/staying in sanctuaries (area near aetherytes) give you “rested” bonus xp towards leveling. You’ll notice a small moon-shaped symbol next to your XP bar. You interact with the Market Board(MB) via Retainers. You can look at price comparison and history when buying off of the MB or listing something w/ your retainers (also get retainers and send them out. They can still do ventures while selling). You can have 2 retainers for free. Read your tool tips and don’t disable in-game help. Remember to look at the traits and role actions too. Equip all of your role actions as you get them. Starting at level 50, you will start earning Tomestones of Poetics and you can buy some of the best level 50/60 gear available from Auriana and Hismena (Locked behind HW). I recommend to not use Gil on the MB for gear from this point onwards. You’ll unlock the quest for the Zodiac/Anima relic weapons at 50/60. These are purely for glamour now so consider these end game activities. Crafting and gathering is completely optional. It’s a large commitment if you want meaningful objective returns. Feel free to take these as a way to break monotony from questing. (More on this later). I recommend using the legacy control scheme if you are using keyboard & mouse. Without going into too much details, it essentially boils down to how the camera will play weird quirks with your movement while casting and moving away from your target. Standard controls do allow a more complete control over character facing and is useful for warriors in particular, however. I encourage you do give both a try, even if you are coming from WOW. Macros are tricky. They are coded to not queue properly, so do not tie them to a GCD and only use them when you fully understand how macros work in this game. Be friendly, say you are new when joining group duties for the first time. Most people will be mindful. A quick and easy resource for encounter guides is the series done by MTQcapture. Also check out this handy tanking infographic. When using the DF on the JP data center, include all other language options to reduce queue time. When you need to travel to the Waking Sands later on, teleport to Limsa, then teleport to the arcanist guild aetheryte, and take the ferry. There is a timer’s tab (Default Ctrl + U) that shows you when various weekly caps reset. Early zones may seem quiet and inactive, but that’s because the majority of the player base hang out in certain end game hubs, cities, or housing wards. There is also no global chat aside from the Novice Network(NN), so many players will be conversing in their Free Company(Guild) chat or in private Link Shells (private chat rooms). The NN is a channel populated by mentors who have satisfied the requirements set by the game designers, and have the ability to invite new players in order to provide help. Ask anyone with a Crown symbol next to their name to do so. The quality of this channel is inconsistent, as mentors are not always helpful (but they can be), so use this at your own discretion. After subbing to the game, remember to get a recruit a friend code. /r/ffxivraf is an option if you have no preference on who gets credit. You can optionally add a 2-factor authentication to improve account security and gain a free teleport location. There is a Companion App for mobile that grants another cheap/favorite teleport spot and MB tools. End game – Finally! Now that you are 70 and caught up with the MSQ, what’s next? Gear helps you do more damage, or take more hits, and is vital for tackling challenging content. Thankfully, it is not too difficult to catch up on gear to do current patch content. When you first get to 70, remember to complete your final job quest to pick up a set of item level (ilvl) 290 armor and weapon. The next “easy” set (ilvl 330) to get is obtainable with centurio seals from Satsuya / Other similar NPCs. These can be gotten via Hunts. Hunts are a great way to earn end game currency as well. Join a hunting LinkShell(LS) in your server by shouting (/sh) in major cities/hubs. Dungeons currently award up to ilvl 355. Treat this as a means to access the various roulettes and ilvl gated content. The various roulettes mentioned before should also reward you with Mendacity and Genesis tomestones. They can be exchanged for 360/390 gear respectively. On top of which, there is a series of 24-men alliance raids in each expansion that award upgrade tokens that augment tomestone gear by +10 ilvl. The current relevant alliance raids are Royal City, Lighthouse, and Monastery. They are the equivalent of LFR from WOW and not too challenging. Normal mode raid gear is also an option – rewards up to ilvl 380 gear. The Omega Raid series is the one for SB. SB has also introduced a series of large scaled, instanced based content called Eureka. It is a long, roundabout, and grindy process to get up to ilvl 380 gear and ilvl 385 weapon. This will ultimately lead to the completion of a Relic Weapon as well. In general, always expect there to be one set of crafted gear, and two sets of tomestone gear relevant to the most recent content. ilvl is generally the way to go. If you are unsure, pick the one with the higher ilvl. Weapon > Chest/Leg > Glove/Helm/Boots > Belt > Accessories in terms of stats distribution and influence. You may affix materias to gear, and doing so is crucial if you plan on tackling high-end content. More on this in that section. Probably the most intricate and nuanced crafting system in the genre. – Slightly high barrier of entry. Great source of income as most crafted and gathered items are tradable/sellable to players. Gatherers and Crafters are their own jobs, meaning that they have numerous skills, job quests, and their own rotations that have to be learned and mastered. It is typically an all or nothing ordeal, because every DoH jobs have their own cross-job skills that can be used by all other DoH jobs. And as such, they are extremely vital in completing difficult recipes. DoHs are the primary source of housing items, glamour, raid consumables, and many other useful items, but are not required at all for most content. DoHs also allow players to repair their own gear, or (Over)meld materia to gear. I recommend getting BTN/MIN leveled first. Gathering your own materials will make leveling the crafters much less costly. The general leveling order of crafters is – Everything to 15, CUL to 37, CRP/WVR/ALC to 50, everything else to 50, then 60/70. This order prioritizes getting the more powerful aforementioned cross-job skills to ease the leveling process. The systems in place are complex, and it takes time and resources to fully understand. It is best explained by this wonderful guide if you want to explore further. A Crafting Calculator is helpful for figuring out macros. There are a large number of mounts, minions, titles, and achievements to collect, and great resource regarding this is apkallufalls. Housing can also be an lengthy endeavour if you want to secure a prime location and fully furnish it. Try picking up a different job! They are all unique and have their own story and mechanics. For leveling alts, repeating the highest leveling dungeon available for tanks/heals is the norm (short queues), but dps might find the best results from spamming Palace of the Dead floors 51-60. Fishing, unlike its gathering counterparts, is generally more time consuming and is basically its own minigame. It can take a lot of time to collect them all. Dive into a Deep Dungeon, you can go for challenges or use it as a alternative way to level up combat jobs (DoW/DoM). The Gold Saucer is another side area filled with minigames and unique rewards. Here we are. These are some of the more challenging aspects of FFXIV, and is why some players choose to pursue the combat side of FFXIV. They reward players with the best available gear and is a noticeable step-up in difficulty from anything else you’ve done up to this point. Expect to die/wipe, a lot, but it will all be worth it. The Ultimate Difficulty raids are some of the hardest content any MMO has to offer. All of these are balanced and done by 8-men parties, normally consist of 2 tanks, 2 healers, and 4 dps jobs. There is an excellent blog post by Bokchoy about diving into savage you should check out. I will go over these from the easiest to the most difficult. Lenient enrage timer and mechanics that focus more on individual performance. Rewards a weapon only slightly worse than raid counterparts. Has no weekly lockout on loot. A souped-up version of the regular raids. Somewhere around the mythic difficulty of WOW raids (Most easier, some harder). Requires more planning, execution, as well as individual performance than extreme trials. 4 Bosses per tier, 3 tiers per expansion, with the last boss of each tier having a “Faust” or “Door” version that have to be completed before tackling the real final form. Bosses generally ramp up in difficulty with each floor. Loot is capped at one chance per week. Tokens are awarded to be exchanged for specific pieces as a safeguard for bad luck. Only two available so far – UCoB and UWU. Brutally difficult. Requires incredible skill, teamwork, and practice. Awards the ultimate bragging rights, rare titles, as well as cool looking weapons for glamour. Use the Party Finder for anything extreme +, not the Duty Finder. (Unless you are in JP). Everything aside from Ultimate is doable via the PF. But statics (a 8-man raid team) will form to increase consistency and better loot distribution. You can find them in various discords or /r/FFXIVRECRUITMENT. Proper preparation is expected. This means getting the best gear available, with the right melds, and have high-powered consumables to help you eek out the most performance. Check out The Balance Discord. This is your go-to resource for job guides, gearing, raid strategies, and mentors who will be happy to answer job/encounter specific questions. Make sure you read all the pinned information first. Advanced Combat Tracker is the only “addon” available used to track player performance. This is only available on the PC clients and is technically against ToS, but Square Enix will turn a blind eye as long as you don’t harass other players with information from it. This tool should just be used as a tool to help you improve. There will be consequences if you harass players with information obtained by this, you have been warned. ACT can be further augmented with Cactbot and Special Spell Timers. fflogs, xivanalysis, and xivrdps are tools to help you analyze player performance. There is an in-game system in place to evaluate readiness for these content called Stone, Sky, Sea. You can calculate rough dps with the corresponding calculator. Some may disagree, but I recommend that you don’t pick black mage as your first high end content progression job. Not because they are not viable (they are by far the most potent dps job), but rather, it’s better to understand what raiding entails before diving head first as one of the hardest jobs to play well at those settings. You are still more than welcomed to try it first, but keep an open mind that sometimes its okay to try alternative raiding jobs. Unlocks at level 30, and gear has no effect on player stats. Has its own tailored/simplified set of skills/abilities for balance reasons. A three team, up to 72-player objective based brawl called Frontlines. A moba style, 24 v 24 game mode called Rival Wings. Small team, arena based mode called The Feast. (4 v 4 rankes and 8 v 8 unranked). The Revival Wings Discord is your best bet in getting into Rival Wings matches. Rewards are mostly cosmetic (Mounts/Titles/Glamour Items), in addition to some XP and tomestones. xivstyle and ffxivcollection (need to hit the translate button up top) are great sites to browse armor sets. Garland Tools/Data is an amazing tool to look up items/npcs, as well as a timer for gathering nodes. The Lore Train is a great place to refresh yourself on story that you might have missed (Up till SB). ReShade can add more graphics customizations at the cost of performance. Great for taking screenshots. Mudfish is a very inexpensive and potentially helpful VPN to deal with high ping.